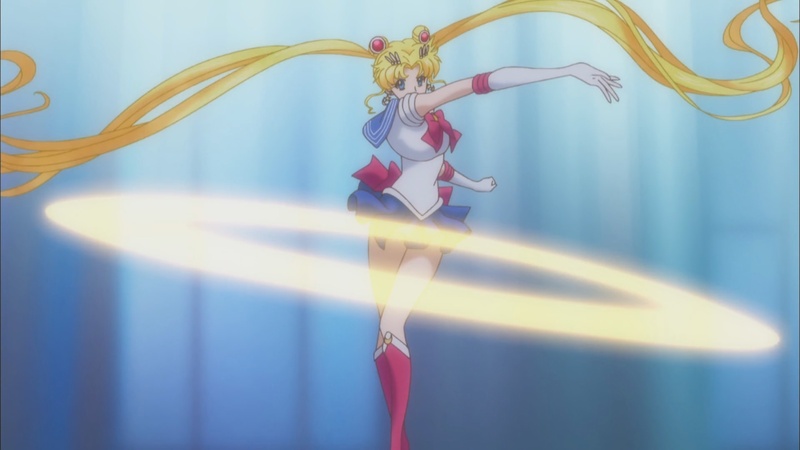 Few attacks in the history of the Sailor Moon series have undergone as many alterations as the sailor-suited soldier’s debut attack in both the manga and the anime. While it’s up for debate whether or not her crying, which unleashes ultrasonic sound waves that distract the youma Morga in the midst of her assault,1 is a special attack in its own right, in the tradition of most anime and live-action shows in the sentai fighting-force line, I think it’s fair to say that anything without an explicit name is just a part of them being super soldiers of justice. Otherwise, you will need to start coming up with names for their ability to jump to high places, a name for Sailor Jupiter’s punching, and more. 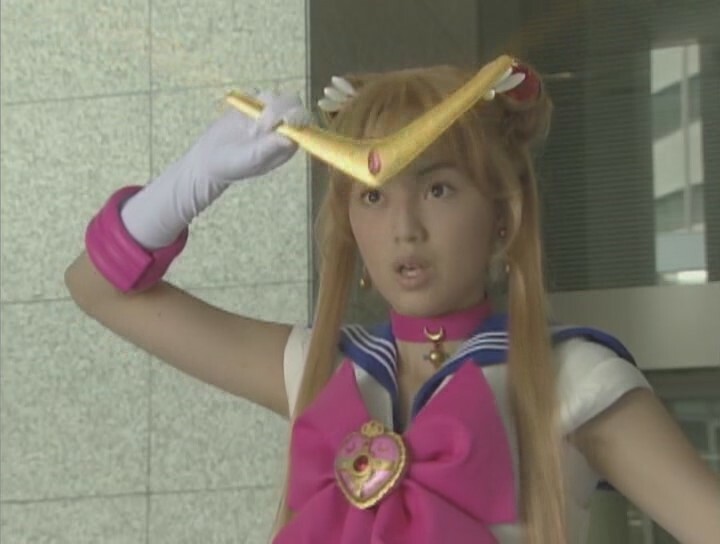 That said, Sailor Moon’s tiara is the first named attack, but its name has gone through several major changes. What gives? 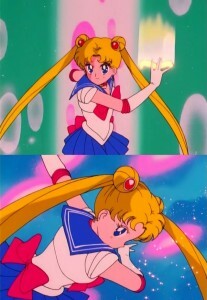 We know that it involves Sailor Moon taking off her tiara, causing it to form into a disc, and then throwing it at the enemy (usually killing them, even chopping the youma’s head off in its first appearance,2 though it was also used to trap Jadeite),3 but unlike many of the other attacks in the series, this one seems to go by a different name with each incarnation. Now, to get to the actual subject at hand of where the name changes come from, the first issue of the manga to anime change obviously comes from the term “Frisbee,” which is a trademark for the popular flying-disc toy held by the the Wham-O toy company.6 This is probably not a risk that TV Asahi wanted to take, so it was quite reasonably changed. Read also: Why Isn't Minako's Name Associated With Venus? 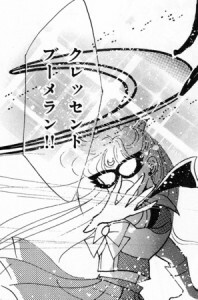 Also of note here is that in the original manga, Luna only told Usagi to shout “Frisbee!” to call out the name of her attack – it was Usagi’s invention to add the “Moon” label in front if it. This has been changed in later versions for the whole attack phrase (i.e., “Moon Tiara Boomerang”) to be given by Luna. The mystery, though, is in where the term boomerang came from. Just by looking at it, you can see that it doesn’t resemble any common form of boomerang, nor does she even use it in a boomerang-like fashion, which is thrown vertically and not horizontally.7 What’s more, you can clearly see that the ends of the tiara come together and form a ring or a disc – most definitely not something I’d be inclined to call a boomerang. What follows is pure speculation on my part, but it’s my belief that it got the new boomerang moniker thanks to the live-action series which, as mentioned above, uses the same name. If you look at the publication dates, you’ll see that the first volume of the shinsouban re-release hit the market on September 22, 2003.8 The TV drama first aired at 7:30am on October 4, 2003,9 with the second episode (in which the Moon Boomerang makes its appearance) airing a week later, on October 11. Considering the lead time needed to scout out locations, record the episodes, make props, and get the special effects work done, it’s pretty obvious that there’s no way it could have all been done in the 19 days between the updated manga publication and the appearance on TV. This was obviously discussed between Ms. Takeuchi and the staff behind the show. Once again, this is just speculation, but it’s my feeling that because this was going to be a TV show with a relatively modest budget, it was easier for them to use a boomerang prop rather than try to make the pure-energy disc that appeared in the anime, or the flying ring in the manga. What’s more, boomerangs (of the non-returning variety) were used by the Aboriginal Australians as hunting weapons,10 so it isn’t too hard to see how that made for a better choice than a thrown ring. Sailor V also has a boomerang attack (the “Crescent Boomerang”), so Ms. Takeuchi is clearly aware of the difference. Ultimately, I believe that Ms. Takeuchi updated her manga script to match the live-action drama rather than the other way around, since it’s pretty clear that these releases were timed to complement each other. Regardless of what the attack is called, it’s still essentially the same in all versions and has the same effect on the enemies, but I really do wish that some more thought had gone into the re-naming to “boomerang” in the manga. Obviously it’s difficult to come up with a cool and exciting name for a disc, but with the new Sailor Moon Crystal now using the manga attack names as well, it really brings into focus just how inappropriate the name really is. All the same, it’s always amazing how something as simple as a tiara can make compelling Sailor Moon trivia and just goes to show that there’s a lot more behind the universe and its characters than you can see at first glance! ← Who Is the Demon Standing Behind Sailor Mars? And then there was the DiC dub, in which I was introduced to the attack as Moon Tiara Magic. To be completely honest, I actually liked how the DiC dub added an extra attack word to each of the attacks. I know some people consider it lame, but I liked it at least. I believe that such a ring-shaped weapon is called a chakram. Of course now that someone’s told me that Tuxedo Mask’s suit isn’t really a tuxedo, I now have to look into whether the headbands the Sailor Soldiers wear are really tiaras or some other variety of crown. Maybe a little inaccuracy in terminology is thought to spice up the naming. 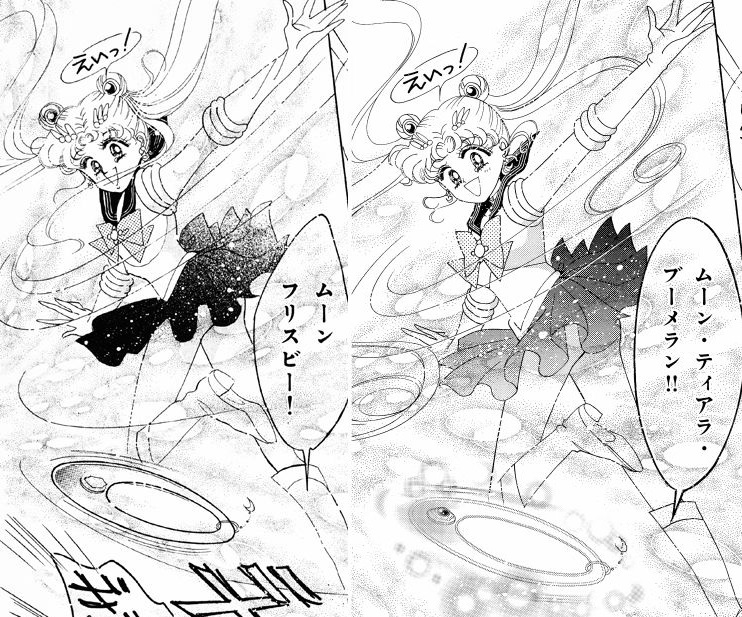 Design-wise, I definitely think that a chakram is what she was going for in the original incarnation of the “moon frisbee” (especially since it appears to be empty in the middle), though it really is something of a bizarre attack since it differs in nearly every incarnation (manga, anime, live-action). Regarding the tiaras, I’ve always felt that they’d be better described as “circlets” rather than “tiaras,” especially since they’re worn low and down on the forehead and not on the top of the head like you’d expect a tiara to be worn. One interesting explanation I’ve read is that the reason for having the tiaras worn on the forehead was that they look somewhat like the Japanese hachimaki that’s worn for competitions and to inspire others in a fight. It also typically includes a red circle in the center (similar to the jewels for each of the Sailor Soldiers) to represent the Japanese flag. Probably not a full explanation, but interesting! As for the tuxedo, I never heard of that! Alas, I’m not much of a suit-and-tie person anyway, but that’s interesting. What does he technically wear? I got intrigued and tried to look it up. Isn’t it more of a tailcoat or swallow-tail like the Japanese emperor is wearing on very formal occasions? The tuxedo looks most certainly more like a normal suit with a bow tie instead of a standard tie from afar. This is a pretty in-depth breakdown of everything Tuxedo Mask does wrong with his “tuxedo”. I mean, does he do anything right with his tuxedo? Really for the more circular attack in the manga with the hole in the circle in the manga I think Moon Tiara Chakram would be a better name for the attack as it looks more like a Chakram. The attack in the 90s anime Moon Tiara Action though kind of more looks like an actual frisbee or discus once the tiara comes off and spins into that golden energy circular shape without a hole in the center. I absolutely agree that chakram would probably be a much more accurate name, though I have to say that in terms of being easy to say and/or being recognizable to fans (outside of those who watched Xena: Warrior Princess, of course) it probably wouldn’t work well with a Japanese audience. Then again, most people don’t know what a Glaive is either, so who knows!